ReliefBand Reviews - Is it a Scam or Legit? ReliefBand’s patented, adjustable neuromodulation impulses are sent through the median nerve in the wrist to the brain, where they promise to reduce nausea and vomiting. Whether you suffer from nausea, retching, or vomiting caused by motion sickness, seasickness, morning sickness, vertigo, chemotherapy, or virtual reality rides, the ReliefBand wearable device uses patented, hospital-proven technology that promises to help you quickly and effectively find relief. Specifically, the website advertises that the technology “leverages the body's natural neural pathways to re-balance signals to the center in the brain responsible for the sensation of nausea.” This way, it’s said to work without the use of drugs or other medication, as well as without side effects. Can you realistically expect ReliefBand to deliver all of these benefits instantly? Let's start by taking a look at the underlying causes of nausea before diving into its specific technology. Sites like WebMD, Healthline, and the Mayo Clinic explain that nausea and associated vomiting are symptoms of separate conditions, and not conditions themselves. As such, they can originate from many different causes, including intense pain, emotional stress, certain medical conditions and diseases, some medications, and ulcers, to name just a few. Motion sickness, seasickness, vertigo, virtual reality rides – Here, your brain can become confused after receiving conflicting sensations picked up by your inner ear, which is directly responsible for balance. This can be the result of repeated, unfamiliar movements (such as on a boat or a rollercoaster), an inner ear infection, or differences between what the brain and body sense (virtual reality). Morning sickness – A result of increased and hormone levels in the body. Chemotherapy – Here, radiation and other treatments can trigger the chemoreceptor trigger zone (CTZ) of the brain, leading to nausea and vomiting. In the instance of ReliefBand, how does it address all of these different causes? Using a built-in rechargeable battery, ReliefBand powers a hypoallergenic contact on the underside of its wristband (what the company calls a SmartBand). The website explains this generates “a pattern of [gentle,] highly specific pulses that modulate the median nerve [at the P6 location] on the underside of the wrist,” using a process called neuromodulation. After applying a small drop of conducting gel to the P6 nerve area on either wrist, we’re told these electrical signals travel through the body’s neural pathway, and to the nausea center of the brain; specifically, to an area called the dorsal vagal complex. There, the signals work to modulate the vagus nerve, restore “gastric rhythm” by normalizing nerve messages from the brain to the stomach, and immediately relieve the sensation of nausea. The company tells us this patented technology is also FDA cleared to treat motion sickness, and that their unique neuromodulation technology was developed for use in hospitals. 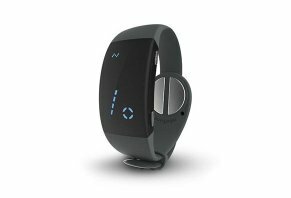 On the outside, ReliefBand features a sleek design with an LED screen that displays the level of intensity (1-10 bars), as well as battery charge and therapy indicators. On the side, the top button increases modulation intensity, while the lower button decreases the intensity and will turn off if the device is held in place for a few seconds. The manufacturer tells us that ReliefBand is water-resistant and can withstand a few splashes of water, but it should not be submerged. Also, despite its fitness tracker-like appearance, they emphasize this is only for the treatment of nausea and vomiting. What’s the Difference between ReliefBand 1.5 and 2.0? 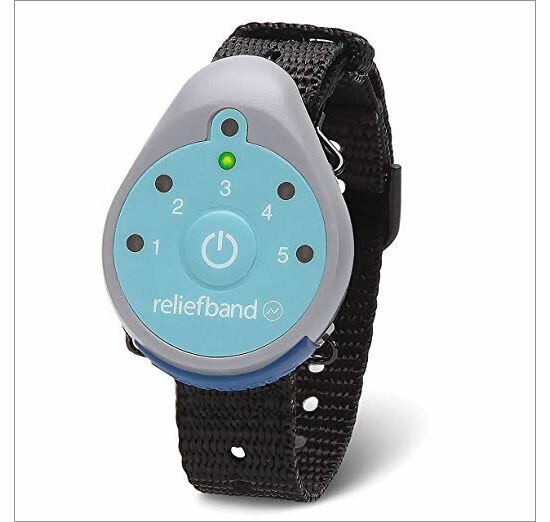 Although both the ReliefBand 1.5 and 2.0 versions are FDA cleared devices for treating motion sickness and morning sickness in pregnant women, the newer version features a sleeker design, a digital display, and rubberized (versus nylon) strap. It also comes with a built-in rechargeable battery, compared to the original’s replaceable Lithium-ion cell batteries. Based on the company's answers to customer questions on Amazon, 1.5's battery lasts up to 150 hours, whereas the 2.0 will last up to 18 hours and will take approximately 45 minutes to recharge fully. ReliefBand 2.0’s hypoallergenic surgical steel contact is located underneath the wrist with the LED screen pointing toward users for easy access, while 1.5’s face and copper coated contact are both located under the wrist. Finally, the 1.5 comes with five impulse strengths, while the 2.0 offers 10 different strengths. How Much Does ReliefBand Cost & Where Can You Buy? Available in Charcoal and Blue colors, ReliefBand 2.0 is priced at $174.99, with free US Ground shipping. We also found the model sold via third-party sites like Amazon and Walgreens for about the same prices. The 1.5 was still available through Amazon at the time of our research as well, for $94.99. Each 2.0 order comes with a charging cable and a 7.5 ml tube (0.25 oz) of hypoallergenic conductivity gel. Replacement gel can be purchased from ReliefBand for $14.99, or from Amazon for $11.99, plus $6.95 S&H. All direct orders also come with a 60-day nausea-free guarantee and warranty, less return S&H charges, which you can request by calling 877-735-2263 or sending an email to customerservice@reliefband.com. Between their 1.5 and 2.0 versions (since they’re described as using the same core neuromodulation technology), more than 500 Amazon customers had given ReliefBand an average rating of about 3.7 stars at the time of our research. Compliments commonly referenced effective relief from nausea caused by a range of conditions, including related to motion sickness and chemotherapy, along with competitive pricing. In contrast, complaints frequently cited ineffectiveness in addressing nausea, that the battery doesn’t last long (specifically, that the unit is continually draining power when unplugged, even when turned off), fit concerns (too large or too small), higher price than the previous version, and the fact that you must use contact gel for its pulses to work effectively. Back in March 2017, PC Mag’s Sarah Kovac had an opportunity to test the ReliefBand 1.5 model (again, it and the 2.0 are described as using the same core neuromodulation technology) on a flight from Missouri to Texas, and found that it worked well during takeoff. However, it seemed to lose much of its effect during an especially rocky landing. The closest option we encountered to ReliefBand during our research was the EmeTerm anti-emetic electrode stimulator ($91, Amazon), which also featured a slim design, rechargeable battery, and hypoallergenic construction, and was available in two different colors. However, it only included five intensity levels (versus the 2.0’s 10 settings), featured an IP65 waterproof rating, and was also advertised as effective for addressing altitude sickness. ReliefBand comes in a prescription-only version as well, which Aetna considers "medically necessary for the treatment of postoperative nausea and chemotherapy-induced nausea that is unresponsive to antiemetics and other conservative therapies." This could be useful if your nausea is especially severe. 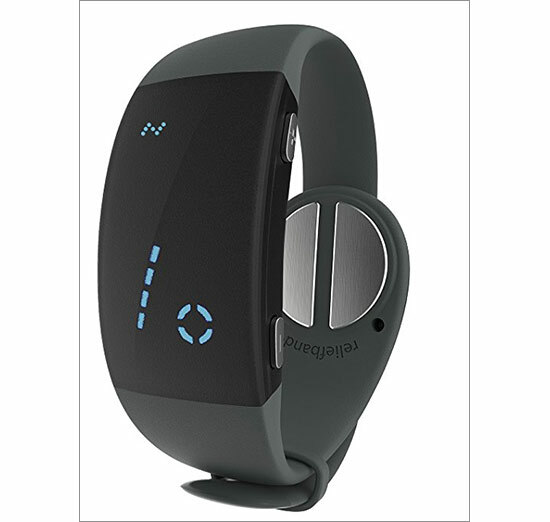 Outside of this, there’s Sea Band, a sweatband-type product with a plastic stud that’s placed over the P6 acupressure point on either wrist. While it claims to address the same nausea, motion sickness, and morning sickness as ReliefBand and EmeTerm, the fact that it contains no electronics means that customers can pick up a pair of Sea Bands for $12.99, compared to the competitor’s $91 and $175 price tags, respectively. Additionally, there are perhaps dozens of generic P6 "Nei-Kuan" acupuncture point stimulators available via online marketplaces like Amazon and Google Shopping competing with unpowered products like Sea-Band, many of which could be found for less than $8. Is ReliefBand the Answer to Your Nausea & Vomiting? As we learned earlier from sites like the Mayo Clinic and Healthline, similar to the sensation of pain, nausea and vomiting are symptoms indicating that something’s wrong—but not specifically what’s wrong. As such, if you’re experiencing frequent symptoms, you should talk with your doctor about options that could best address your diagnosis. With this caveat in mind, we encountered several clinical studies published on sites like the National Institutes of Health’s PubMed indicating that electrical stimulation of the P6 nerve can help meaningfully reduce nausea symptoms. Many of these were also cited on the ReliefBand website. In fact, as we learned in the previous section, the Aetna health insurance company may even provide coverage for prescription-level ReliefBand devices aimed at addressing nausea that's unresponsive to other treatments. Pro tip: The Memorial Sloan Kettering Cancer Center explains that you can try activating this same nerve using only your thumb, which could help you achieve the same results without spending money. In addition to this clinical support, Horsham, PA-based Reliefband Technologies, LLC held an A+ rating with the Better Business Bureau, based on no closed complaints, as of 8/7/18. They also offered a 60-day refund policy on all ReliefBand purchases, which is essential, since no treatment (nausea-related or otherwise) will work for every patient. Given this, it might be worth the potential return shipping and handling charges to give ReliefBand a try, should you end up dissatisfied. Again, just be sure to consult with your physician in advance. I purchased a 1.5 ReliefBand from Amzon about two months ago to take on vacation with me. I get very nauseated when in a boat on a sunset sail or to go snorkeling. I also get nauseated when riding in the back seat of a car. Our transportation on the trip was a golf cart and I had to sit on the back seat so I was not facing the way we were going, I got very nauseated, and the ReliefBand did not help any as far as I could tell. It also didn't help on the sunset sail. I was hoping so badly that this device would be the answer to this party killing problem. I love being on the water, but I will be land bound until I find something that works without making me fall asleep on the trip. So very disappointed. Write a Review for ReliefBand!